It is little known that, apart from the big monastic granges, there were granges similar in size and shape built on farms of the aristocracy in France and in England too. The origins of the latter may be paralleled to the monastic ones. 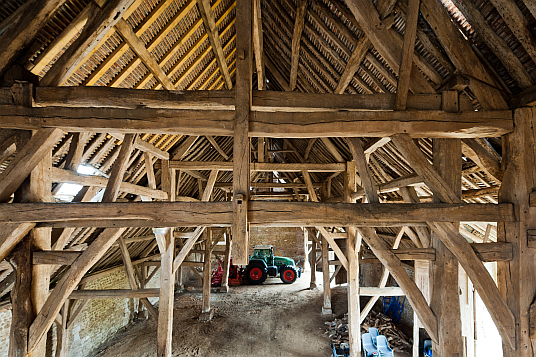 In contrast to monastic contexts, where the construction of new granges came to a standstill due to the decline of Cistercian Order, the aristocracy, especially the landed gentry, continuously built this type of barn up to modern periods. However, the Hundred Years’ War between 1337 and 1453 deeply affected building activity here too. Only after the end of the war in the course of an economic rebound, building activities increased again. Even damaged or destroyed granges were repaired or rebuilt. Thus an amount of 5 big granges has been erected between 1488 and 1493, only in the Département Eure/Haut Normandie, which have passed nearly unheeded by building researchers up to now. Villeron, Département Val d'Oise, Ile-de-France. Grange de Vaulerent, built in the first half of the 13th century. 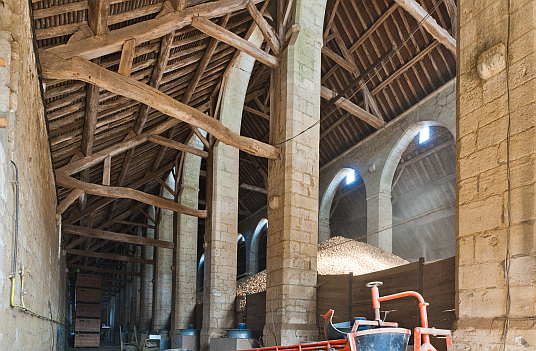 The biggest monastic barn in Europe with its length of 72 m. One of 15 barns of the Cistercian abbey of Châalis. The roof was destroyed in 1446 and afterwards rebuilt in another shape. We have been able to investigate one of these granges three years ago. 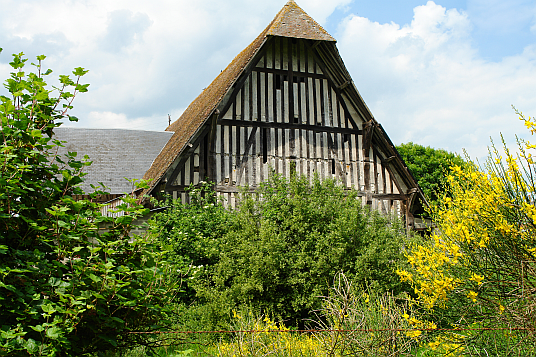 We visited a noble farm stead in Aclou, next to Rouen in Normandy, which –among other buildings- consists of a well preserved manor, dating to 1360 (d) and a big grange showing external timber framing. The inner structure was well comparable to those constructions we know from Cistercian granges – even in space. It could be dated dendrochronologically to 1492 (d). The exact number of granges of this specific type still existing on noble farms is not known. Up to today, only a few of them have been investigated. 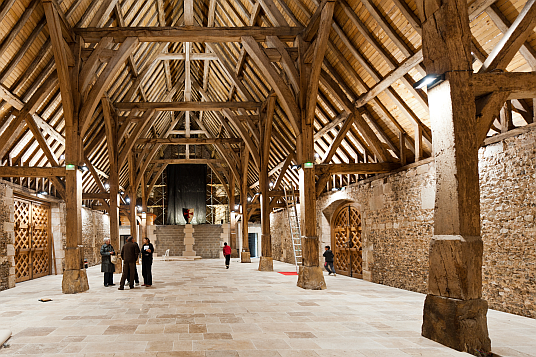 Nevertheless, those few well known exemplars still show that the architectural tradition of the monastic barns survived on the farmsteads of the aristocracy, interrupted only by the Hundred Years’ War. The youngest known grange was dated to 1766±6 (d). 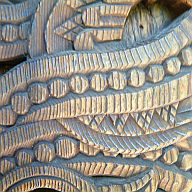 It can be found at the domain of the Benedictine abbey St. Ouen, Rouen in Daubeuf la Campagne.